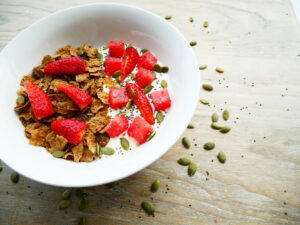 Pop the Sultana Bran in a bowl and simply add the Greek yoghurt, chopped fruit and seeds. This is a great recipe for kids and adults alike – to get the kids involved in making their own breakfast, spread out a variety of toppings including chopped fruit, milk, yoghurt, nuts and seeds and let them help themselves. Recipe kindly provided by the Kellogg Nutrition Team – for more recipes visit their website.